There were several moves on the pitching front this week, with one of the more notable moves being Jake Cosart (pictured, right) getting sent from Portland to Salem. After starting the year with 11 scoreless innings, Cosart was 0-2 over his last six appearances, with an ERA of 18.32 over 9 1/3 innings while allowing 20 hits and six home runs. 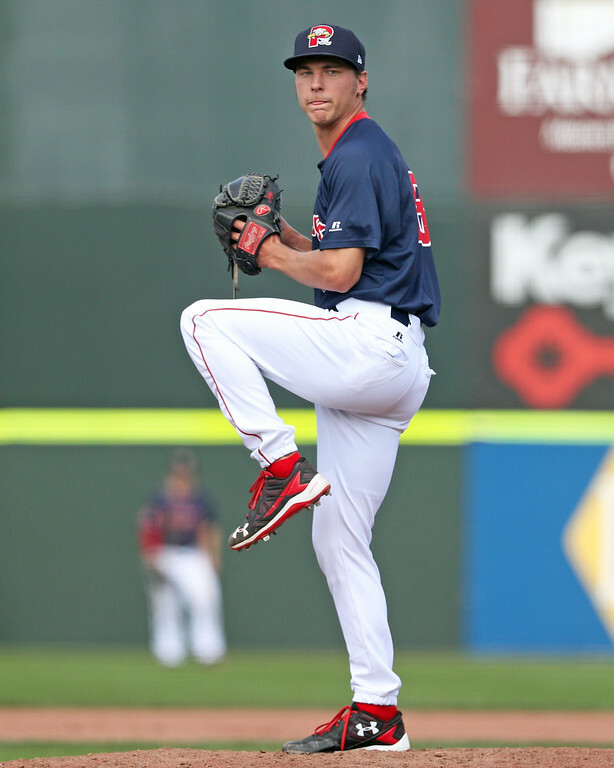 Expectations were high last year for Cosart after winning the 2016 SoxProspects.com Pitcher of the Year award, but his control took a step back in 2017 in Portland and his performance has fallen off significantly this season. Tyler Thornburg appears close to returning to the big leagues, but the Red Sox want him to make a few more rehab starts before that happens. The Red Sox recalled Thornburg from his rehab assignment without activating him last Friday, so the earliest he will appear in a major league game would be this Friday. With Hector Velazquez being activated from the disabled list last Thursday, Bobby Poyner was optioned to Pawtucket. Poyner has allowed only two runs over his 9 2/3 innings in Boston this year. Salem placed Nick Sciortino and Algenis Martinez on the disabled list but activated Roniel Raudes after he missed his last two starts. It has been a tough start to the season for Nick Duron as his ERA currently sits at 7.92 over 25 innings for Greenville. He was placed on the disabled list on Thursday with an undisclosed injury. The Red Sox picked up an 18-year-old pitcher from the Dominican Republic last week when they signed left-hander Hansel Viola. Viola will likely appear for one of the Dominican Summer League teams out of the bullpen. Both Fred Lynn and Mike Tamburro were officially inducted into the PawSox Hall of Fame. Tamburro is the co-owner and Vice Chairman of the PawSox and Larry Kessler of the Sun Chronicle talked with Tamburro about what he has accomplished over his 44-year baseball career. After missing the first two weeks on the season with a hamstring injury, Ockimey (pictured, right) has stepped right in and been one of Portland's best hitters. The big week raised his triple slash to .280/.393/.464 on the season, and his OPS is now approaching 1.000 in May. 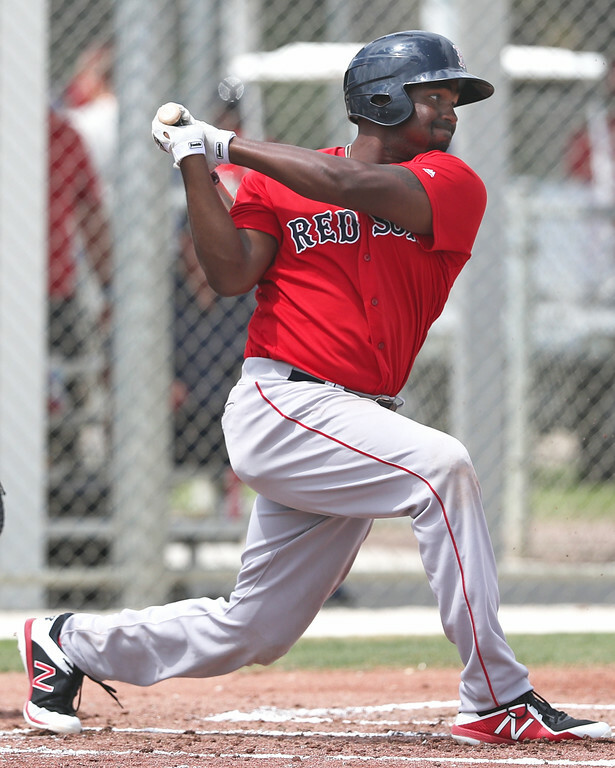 The ninth-ranked prospect in the system, Ockimey may soon pass Sam Travis as Boston's top prospect at first base, a position that currently has no long-term answer. Reyes struck out seven over five innings of one-run ball in his first start of the week, but he took a big step forward on Sunday when he tossed a three-hit shutout, with eight strikeouts over the nine innings. Senior Staff Writer James Dunne has more detail about Reyes in Monday morning's Cup of Coffee. After opening the year in a piggyback role, Reyes has been a starter over the last month, going 2-3 over seven starts with an ERA of 1.93 and 47 strikeouts over 42 innings. The 21-year-old has been a pleasant surprise for a Drive team that has struggled throughout the season.